No Fishing Allowed - Leandros A. Vrionedes, P.C. 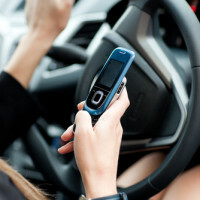 This summer a Nassau County judge denied the plaintiff’s request for the defendant’s cell phone records, despite expert testimony stating that cell phone use may have been the cause of distracted driving which resulted in the death of the plaintiff’s son, who was struck and killed in a vehicle-pedestrian accident. The accident occurred on April 4, 2012, when Anthony Michael D’Alessandro was struck and killed by a vehicle driven by Jane Baldwin. Mary D’Alessandro, the mother of Anthony Michael and the administratrix of his estate, filed a motion with the court to compel Jane Baldwin to authorize the release of cell phone records for herself and Robert Baldwin, and any other cell phone records for any phone which may have been in the car at the time of the accident. The pre-trial phase of litigation is known as Discovery, because it is the period when both sides of the case are permitted to “discover” relevant evidence the other party may possess. New York has a very broad discovery rule, CPLR 3101, which requires “full disclosure of all matter material and necessary in the prosecution or defense of an action.” Even though this rule is written very broadly and interpreted very liberally by the courts in favor of disclosure, a disclosure request may still be turned down if it is overbroad, burdensome, lacking in specificity, or seeking irrelevant information. The judge has broad discretion to decide what is material and necessary and what isn’t. In support of her motion, the plaintiff presented testimony from two expert witnesses – an accident reconstructionist and an engineer – who testified based on a visibility study that the defendant would have been able to see pedestrians for over five seconds prior to the impact, and that the defendant was likely distracted at the time of the accident, possibly by usage of a cell phone. Despite the expert testimony, the court sided with the defendant and held that the plaintiff’s assertions that the defendant may have been using a cell phone at the time of the accident were conclusory and completely speculative. An earlier case, Morano v. Skanska, Inc., had held that unless there is some witness testimony that a cell phone was being used at the time, a person’s privacy interest in cell phone records should be protected. The court in this case held that the plaintiff did not provide any direct evidence of cell phone use and that her request for cell phone records was nothing more than a “fishing expedition” for possible evidence to use against the defendant. The rules of Discovery are broad, but they are not that broad. The plaintiff’s motion for the defendant’s cell phone records was denied.